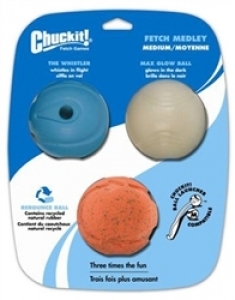 Now you can have three times the fun with this collection of Chuckit's!® newest balls. Rebounce: Environmentally friendly design utilizes recycled natural rubber.These are all Chuckit!® compatible. Fun bright colors. Use with Chuckit! Ball Launchers. Whistler: Twitters and whistles in flight. Easy to clean, made of natural rubber. Use with Chuckit! Ball Launchers. Max Glow Ball: Bright, long lasting glow. Charge quickly under any bright light, no batteries needed. Easy to clean. Use with Chuckit! Ball Launchers.